The Nightwork (2014) published by Telltale Press. One happy outcome of this short collection is that the Canadian poet Rhona McAdam, whose poetry I have admired for decades, wrote this lovely blurb for me – as well as offering me some sound advice. Neil Young in The Interpreter’s House. Every line insists on attention in Peter Kenny’s The Nightwork (Telltale Press), and yet there’s a lightness of touch to the writing that rendered its craft seamless. An undercurrent of anxiety – and the dangers lurking in our apparent normalities — combine with wit and a fluidity of language to tug the reader along from first to final lines. This is a poet at ease with his talents. Everyday observations juggle with snapshots from mythology and history, but nothing jars. The opener, ‘A Sparrow at 30,000ft’, holds out a wry foretaste of what’s to come, with the speaker internalising reassurances that are sure to prompt an amused nod of recognition among readers: “Cattle class, in clear air turbulence / this shuddering is perfectly normal”. Charlotte Gann in The Frogmore Papers says What I like about this pamphlet is how it invites the reader into its own world of atmospheres. I have real sympathy for the almost tragi-comic I that soldiers through this…. Kenny takes us into a world of mythological birds and beasts, of domesticity and loss and the brute reality of functioning as a human, hair tidly combed, (‘One under’). There is real anguish here, held securely in poems of reflective subtlety. John Forth in London Grip says ‘Peter Kenny’s work is fun of a serious kind… most of his trips to a hinterland of waking dream in this pamphlet will do his reputation no harm…. But if, as seems likely, this pamphlet begins an invasion of the mainland, it’s a welcome one.’ Read John Forth’s full review here. Ian Badcoe in Antiphon found ‘genuinely engaging moments and a wide variety of worlds to choose between… a very enjoyable short read and the quality of materials and presentation are a bonus. I am interested to see what author and publisher come up with next.’ Read Ian Badcoe’s full review here. 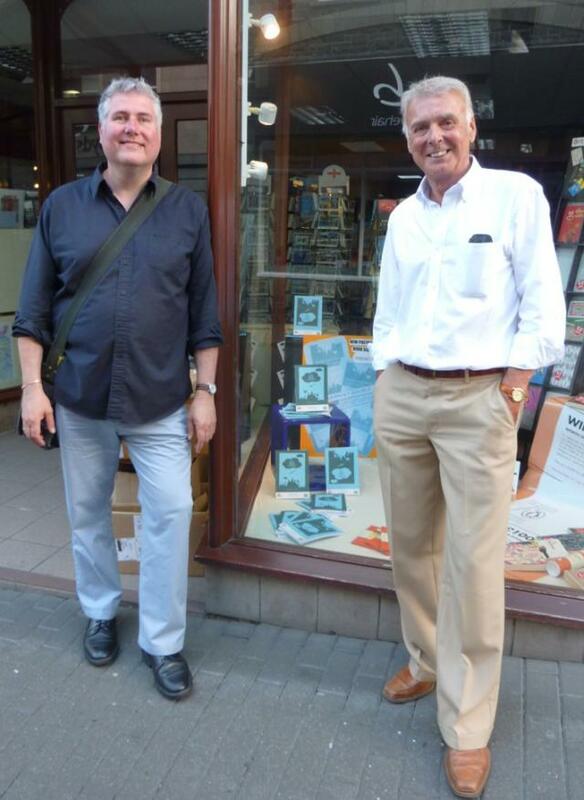 A Guernsey Double was supported by the Guernsey Arts Commission, and was a collaboration with friend and fellow writer of poetry Richard Fleming (below, in his trademark white shirt). Formed of two complementary halves, mine was The boy who fell upwards and Richard’s The man who landed. Professor Edward Chaney Faculty of Media, Arts and Society Southampton Solent University. Author of Genius Friend. 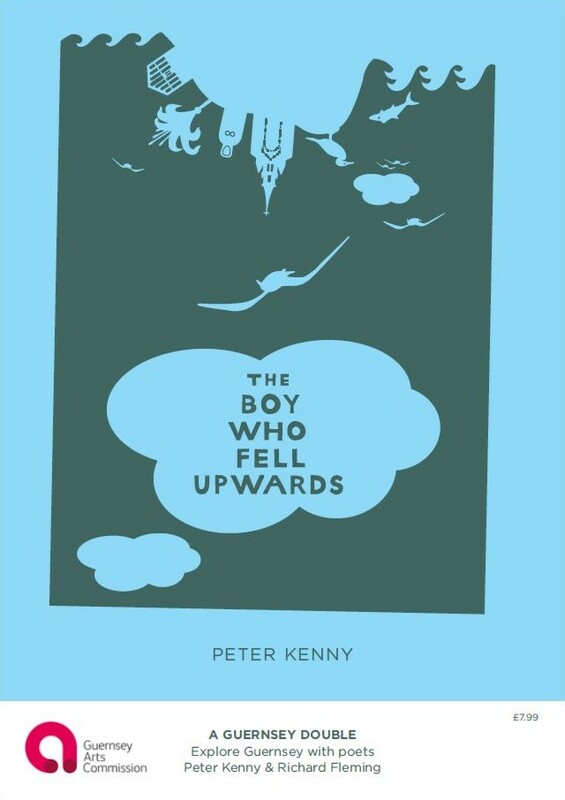 A Guernsey Double: The boy who fell upwards/The man who landed Richard Fleming and Peter Kenny Anthology of Guernsey/Guernsey Arts Commission (2010). Available direct from me, or Amazon.